In 2000, I visited the municipality of Rotorua, New Zealand. A great town with an amazing flag. The flag was black with a stylized white R that was roughly the size of the entire rectangle. I've been searching unsuccessfully for an image of it for quite some time, so I contacted the city's tourism office. Kaye Clarke (Managing Director Stay and Play – New Zealand Tourism Connections) was very helpful in her response. "We were looking to modernise the council logo for our letterheads from the City Coat-of-Arms, the farmer and the Maori, with Tatau Tatau (we together) underneath it being used at the time, which some officers in council, felt it was dated for letterhead use. We called for ideas from graphic artists and the stylised R was the one we chose, as the R simply stood for Rotorua and the rings going out from it, represented the rings you see going out from boiling mud, which is synonymous with Rotorua. So it was quite simple and readily accepted." — former mayor Grahame Hall. They attached a jpg of the letterhead logo. If you remove the text "Rotorua District Council" and extend the R portion from square to rectangle, you have the flag of the town. It's really quite something, but it's been 14 years since I saw that flag. I was surprised to fail to find this fairly recent logo in web image searches for Rotorua emblematics. Instead, a very different emblem, with a spiral design, shows consistently associated with the Rotorua District Council, some of its offshoots, and other local entities. Even more curiously, though, there is no conspicuous logo in the official website, nor the spiral, nor the "R" (http://www.rdc.govt.nz/). An abandoned test version of a Rotorua District Council website that makes wide use of a spiral logo: http://66.7.200.218/~livework. See especially http://66.7.200.218/~livework/wp-content/uploads/2012/12/RDC-Logo-full-colour.jpg and http://66.7.200.218/~livework/wp-content/uploads/2012/11/feel-the-spirit-STACK-blue-green-300x296.jpg. 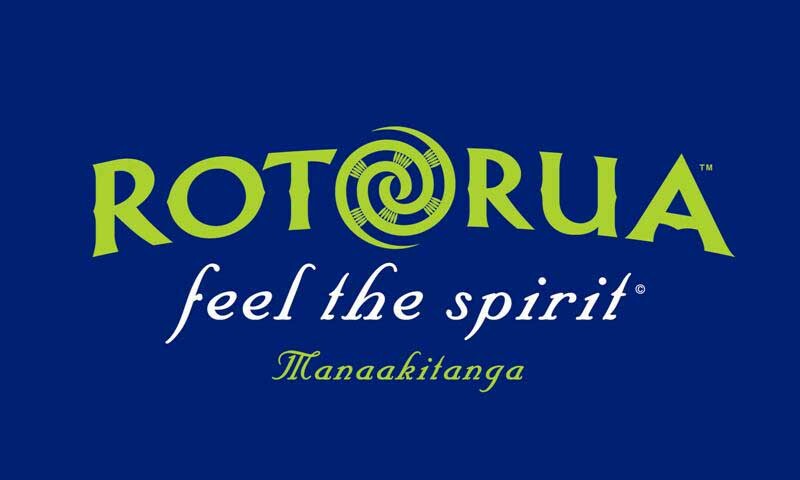 Along with the spiral logo, the English slogan "feel the spirit", and the Maori motto "manaakitanga", meaning "hospitality". These are often found in this especially flag-like arrangement, in white, light green, and darkest blue. From the report http://www.rdc.govt.nz/AgendasAndMinutes/Council/2014/Agenda%20Council%20meeting%2027%20November%202014.pdf recommending council's latest "brand refresh", adopted on 27 November 2014, we learn that the logo with spiral design, the Takarangi, substituted for the second 'o' of Rotorua was adopted 17-18 years earlier by the 'Feel the spirit' community brand, and so was used alongside the 'R' council logo reported by Alex. Then, around 2004-5, council replaced the logo with one using the 'ROTORUA' with Takarangi 'O' and colours from the community logo. 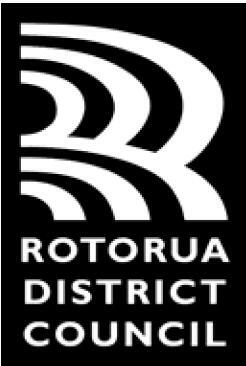 The council logo didn't include the 'feel the spirit' motto, but instead had the word 'DESTINATION' and a curved line above the 'Rotorua', with the words 'ROTORUA DISTRICT // COUNCIL" on dark background below. A white on black version of this logo appeared on the council website by 9 September 2005. In 2012, the tagline 'Shaping Rotorua' was added to the left of the council logo, in white in two lines on a blue background, with the Takarangi before Rotorua. The Takarangi was designed by artist and carver Lionel Grant, and associated with the "Rotorua's core qualities": the people, the vibrant Maori culture, the historical standing as a bicultural district, legacy in tourism and forestry, and evolving landscapes. (PMS 1585 C). (See "Council's Logo" http://www.rdc.govt.nz/our-council/about-council/ourvision/Pages/Council's-Logo.aspx.) The Takarangi has been reduced to a supporting element of the brand, not included in the logo. The "Logo Use" page yields seven more similar images. The fonts used are Raleway Bold and Raleway Semi-bold, which will be relevant if we do come across any flags based on the current 'logo'. Google Street View does show a black flag with at least a white 'ROT(takarangi)RUA', as used in the council logo at the time, flying at the council chambers in March 2013. It's not clear whether there are any other elements on the flag. Earlier Street View images (June 2008 and February 2010) show a flag with a green field flying in the same location.